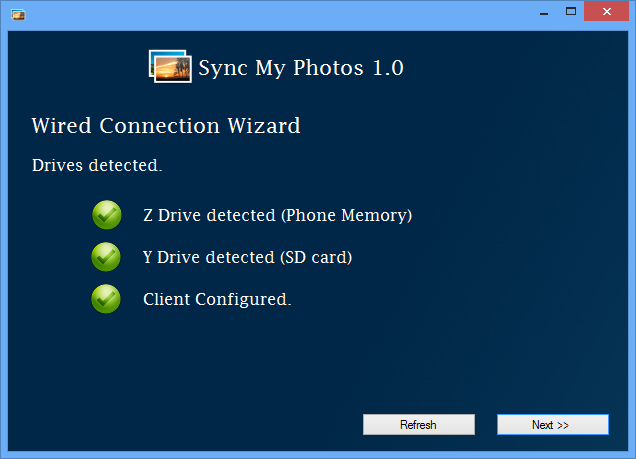 Thank You for installing Sync My Photos.In this help page we will tell you how to configure Wired Connection in 3 easy steps.It is faster,accurate and works with works without any connection problems. 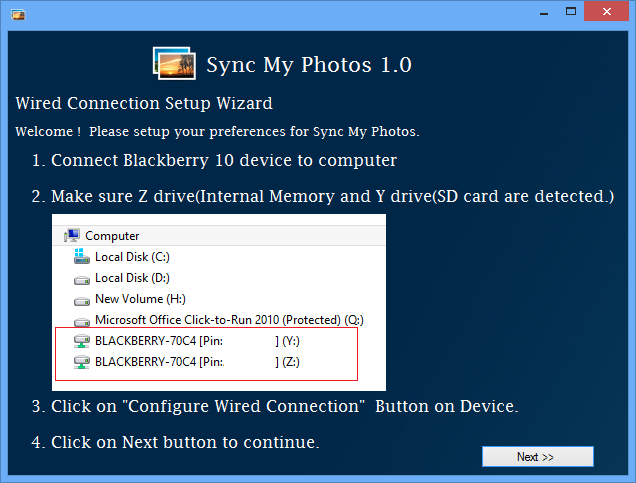 Right click on tray icon of Sync My Photos and click "Sync My Photos"
Step 1 : You will get the window as shown below.Now you have to connect your Blackberry 10 device to your computer using the cable.Once the cable is connected,make sure that the Y drive and Z drive are detected.If you do not have a SD Card in the device,only Z drive will be shown. 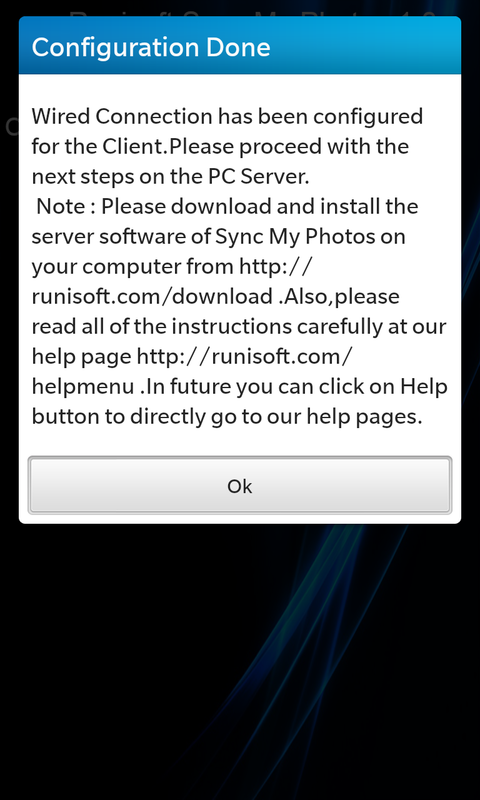 Step 3 : Now click on Next button.If everything goes fine,you will get the Screen below.Click on Next. Note : In case no drive is detected or client is not configured,the Next button will be disabled.Also,error message will be displayed.In such cases,please make the drives available,configure the client and hit Refresh button. 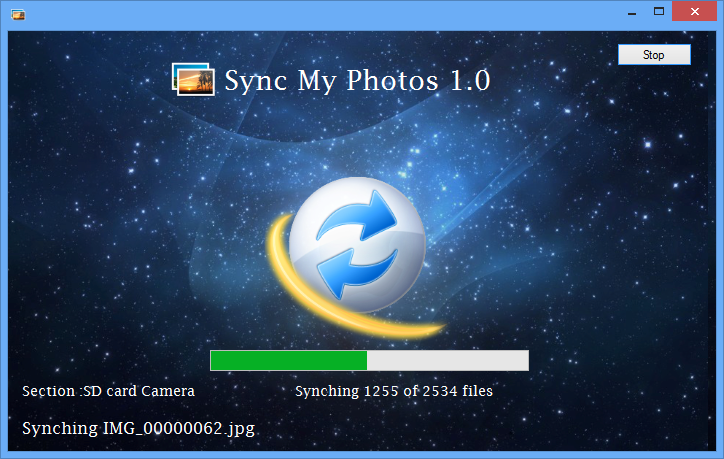 Step 4 : Now in the next screen you will get the screen displaying what to be synched and where to be synched. It displays two sections.One is Phone Memory and the Second one is SD card.Check the checkboxes for the folders you want to be recognized for Synching by Sync My Photos. You need to specify a folder location on your PC where the Photos will be copied to from the Phone.Click on the browse button and select the folder. At last,make sure the last checkbox is checked. 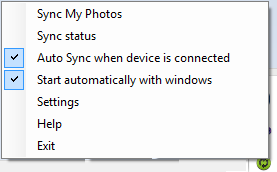 ("Sync photos Automatically when i connect my device. 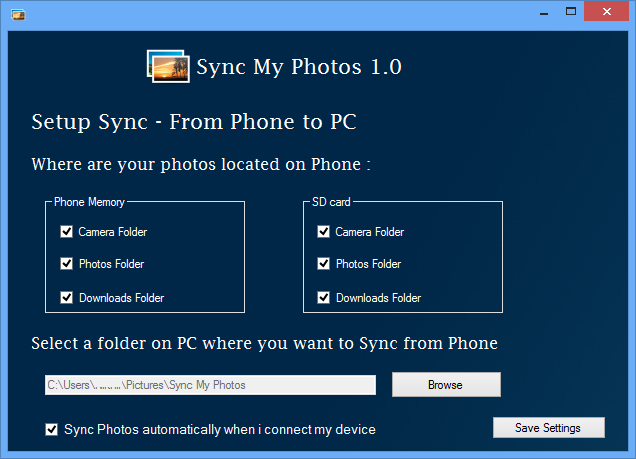 ").If you do not want to sync automatically,uncheck this box.If auto sync is diabled,manual synching could be done by Right Clicking on the tray icon and selecting "Sync My Photos"
Make the necessary settings and hit the button "Save Settings". The Sync Will Start.That's it ! !